Interested in sharing ideas with other gardeners and making a difference in our community? 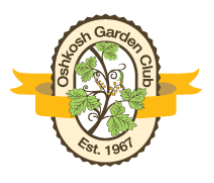 The Oshkosh Garden Club meets on the second Thursday of each month and offers a range of educational programs year round. New members and guests are always welcome. The rewards of belonging to the Garden Club go far beyond the pleasure of growing things. Membership also provides an opportunity to expand your interests and build lifelong friendships while bettering your community and the environment. In addition, because the Oshkosh Garden Club is a member of National Garden Clubs, Inc., membership allows you to connect with an international gardening network. NGC is the largest volunteer organization of its type in the world and offers extensive educational programs, including these regional workshops open to Oshkosh Garden Club members: Flower Show School -- Gardening Study School -- Environmental Study School and Landscape Design Study School. Member, National Garden Clubs, Inc.